THE WRITING BUDDHA - Opinions | Books | Movies: Yes, My Accent Is Real by Kunal Nayyar (Book Review- 3.5*/5) !!! 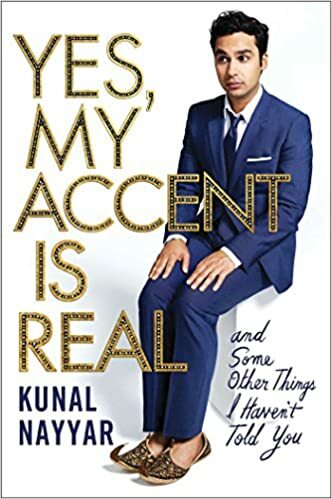 Yes, My Accent Is Real by Kunal Nayyar (Book Review- 3.5*/5) !!! Who doesn't watch and like "The Big Bang Theory"? It's one of the most popular show and specifically in India, I have seen people watch it on their Android smartphones every time I travel in local train. It's the best time pass for the idle people. The characters of the show are favorites of everyone. And the show boasts about an Indian character too- Raj which is played by Kunal Nayyar. The popularity lead him to finally write a book on how he became popular with funny scenarios and events in his life. The name is "Yes, My Accent Is Real". He also adds in the title "And some other things I haven't told you". The book is published by Simon & Schuster publication and it is surely going to be one of the best selling books by them. I haven't seen The Big Bang Theory for more than an episode or two because of the time constraint in my life. As I always chose a book before any kind of video, I ended up reading Kunal's book even when I have no connect with his character. That's the kind of person I am and I am very delighted to tell everyone that the way he have written his tale, anyone can pick up the book and enjoy the funny situations he have shared with us even if you are as stranger with the show as me. Haha! The language is easy and fast pacy. It makes you laugh with each sentence because the way writer have written it, he is telling that he does not deserve to be anywhere but still he lands up and make fun of himself. The good part about the book is that it's not only funny but it becomes serious and emotional too at times when it's necessary. That's when I wanted to salute author for not letting this book look like a wanna-be or asking the reader for a forcible laugh even at the places where the jokes doesn't work. Along with making fun of his whole journey which from an Indian's point of view is quite successful, he also keeps telling where did he have to struggle more than needed and when did he feel low about himself. He have described India beautifully rather than making cheap comments on the nation like few other authors who find it a way of amusing their foreign fans. The only drawback of the book is that the author is confused at times if he have written this book for only his Indian fans or only his overseas fans or for both of them. Sometimes he writes as if he's talking to Indians. Sometimes to the people of his migrated nation. Sometimes with all of us. That confuses us a bit about the approach with which that particular chapter is written. Also, I didn't find the whole description of each ceremony of his marriage funny even when the author have tried to create humor in it. He failed miserably only in that chapter otherwise all the chapters are wonderful if not great sometimes. I give this book 3.5 stars out of 5 and I want to read more from Kunal. GO FOR IT!! !